Part of the challenge of going vegan is finding good vegan body care. Avoiding animal ingredients is just the beginning; you want to avoid animal testing and nasty chemicals, too. By the time you’ve amassed soap, shampoo, moisturizer, shaving cream and anything else you find yourself in need of, you’ve probably gone to way more than one company and driven yourself half-crazy. Wouldn’t it be awesome to be able to get everything in one place? How about everything in one place without settling for tacky “natural” scents and ingredients you can’t pronounce? You totally can, thanks to the Rad Soap Company. I first discovered Rad Soap over the summer at the Schenectady Greenmarket, and this is my collection of their products so far. The unwrapped brown soap is their amazing-smelling Espresso bar, and the Cream & Sugar bar next to it is part of the same line of soaps that have coffee in them. Yep, ground coffee, right in the bar. 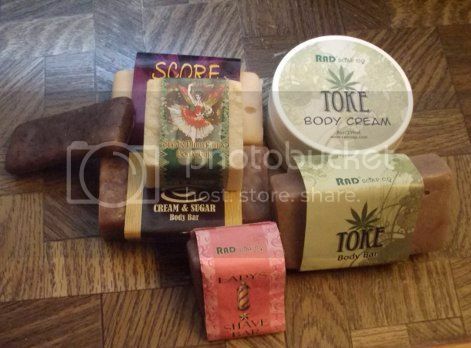 Toke lotions and body bars have hemp oil for smooth skin and a bit of patchouli so you can smell like a hippie–in a good way. The Lady’s Shave Bar has healing clays in it for the smoothest shave ever with no razor burn or nicks, and that’s coming from someone prone to both. (They make a men’s bar, too, in case you were wondering.) Score has a bright, almost citrus scent. I have the purple one, but there are also orange and green varieties with different citrus overtones. At the very top of the pile, you’ll see my most recent acquisition and current obsession, the Sugar Plum Fairy body bar. It’s not on their website, but they’ve been selling it as a seasonal item at the Troy Farmer’s Market for a few weeks now. I kept passing it by because, let’s face it, once your soap collection has begun threatening to bust the seams on a gallon Ziploc bag, you’ve got too much soap. But this past Saturday, I found I couldn’t resist. It smells so Christmas-y, with a little burst of clementine and a big dose of fir tree. The first time I used it, it put me in mind of those clove-studded oranges some people use as holiday decorations. If you need a little extra boost this holiday season, I highly recommend trying Sugar Plum Fairy. Because really, if you love Christmas, why not smell like it? Though I’m probably starting to sound like an infomercial, I have to throw in one more plug. I don’t know about you, but every winter, my hands get disgusting. Dry, papery, cracked kind of disgusting. Maybe it comes from using wood heat and stoking the indoor wood stove at the QV house, but whatever the case, it’s nasty, and I have tried literally every kind of soap, lotion, and hand cream around. Nothing’s worked, so while I was poking around the Rad Soap booth at the farmer’s market, I asked which tester would be best for grossly dry hands. The response was a generous pump of Hoedown Hand Therapy. The scent was a little strong, but, no lie, it only took a few minutes for my hands to start feeling better. The redness and dryness went away and stayed away until I’d washed my hands several times. I’m going to have to go back and get a whole bottle…with that around, my hands might actually make it through a winter looking like hands instead of sandpaper! The best part of all this, of course, is that everything Rad Soap makes is vegan-friendly. So it’s totally okay if you go insane with body products, provided you have enough room to store them. You can find Rad Soap online and at the Troy Farmer’s Market on Saturdays. I’m not sure if they’re still doing the Schenectady Greenmarket on Sundays, but it wouldn’t be hard to check! Be ready to smell a lot of soap if you check these guys out in person–you won’t be able to resist! This post was made because I’m a huge Rad Soap fan, not at their request. QV did receive a “Merry Christmas” discount on the Sugar Plum Fairy soap, because they’re cool like that! These soaps look so much prettier than most vegan soaps, as some of them can be in dark horrible colours! 🙂 All of Rad’s stuff is amazing. The scents are really fresh and the soaps make great thick lather.